What’s life like on tour with pop-star parent Pink? Magnificent marshmallows, raging hormones and ‘beautiful trauma’, discovers Amy Dawson. The 38-year-old singer, born Alecia Moore in Pennsylvania, has good reason to laugh. 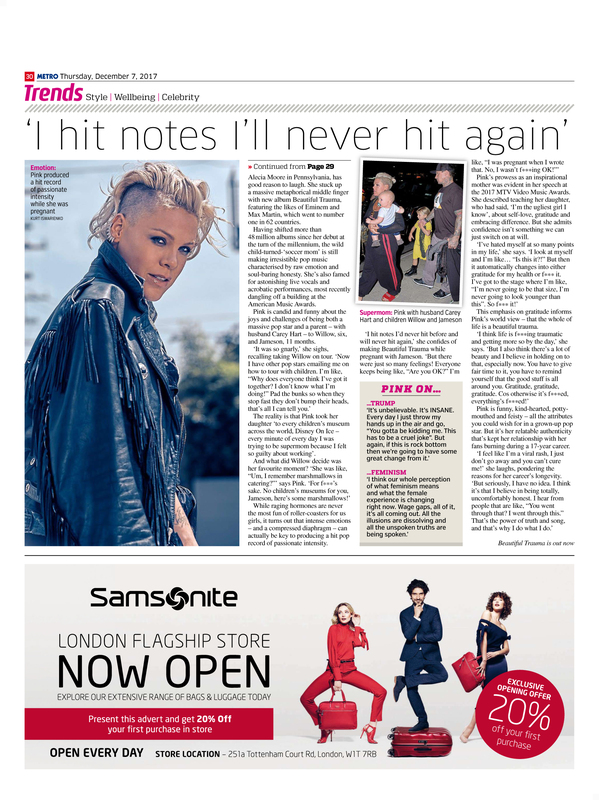 She stuck up a massive metaphorical middle finger with new album Beautiful Trauma, featuring the likes of Eminem and Max Martin, which went to number one in 62 countries. Having shifted more than 48million albums since her debut at the turn of the millennium, the wild child-turned-‘soccer mom’ is still making irresistible pop music characterised by raw emotion and soul-baring honesty. She’s also famed for astonishing live vocals and acrobatic performances, most recently dangling off a building at the American Music Awards. Pink is candid and funny about the joys and challenges of being both a massive pop star and a parent – with husband Carey Hart – to Willow, six, and Jameson, 11 months. ‘It was so gnarly,’ she sighs, recalling taking Willow on tour. ‘Now I have other pop stars emailing me on how to tour with children. I’m like, “Why does everyone think I’ve got it together? I don’t know what I’m doing!” Pad the bunks so when they stop fast they don’t bump their heads, that’s all I can tell you.’ The reality is that Pink took her daughter ‘to every children’s museum across the world, Disney On Ice – every minute of every day I was trying to be supermom because I felt so guilty about working’. And what did Willow decide was her favourite moment? ‘She was like, “Um, I remember marshmallows in catering?”’ says Pink. ‘For f***’s sake. No children’s museums for you, Jameson, here’s some marshmallows!’ While raging hormones are never the most fun of roller-coasters for us girls, it turns out that intense emotions – and a compressed diaphragm – can actually be key to producing a hit pop record of passionate intensity. Pink’s prowess as an inspirational mother was evident in her speech at the 2017 MTV Video Music Awards. She described teaching her daughter, who had said, ‘I’m the ugliest girl I know’, about self-love, gratitude and embracing difference. But she admits confidence isn’t something we can just switch on at will. 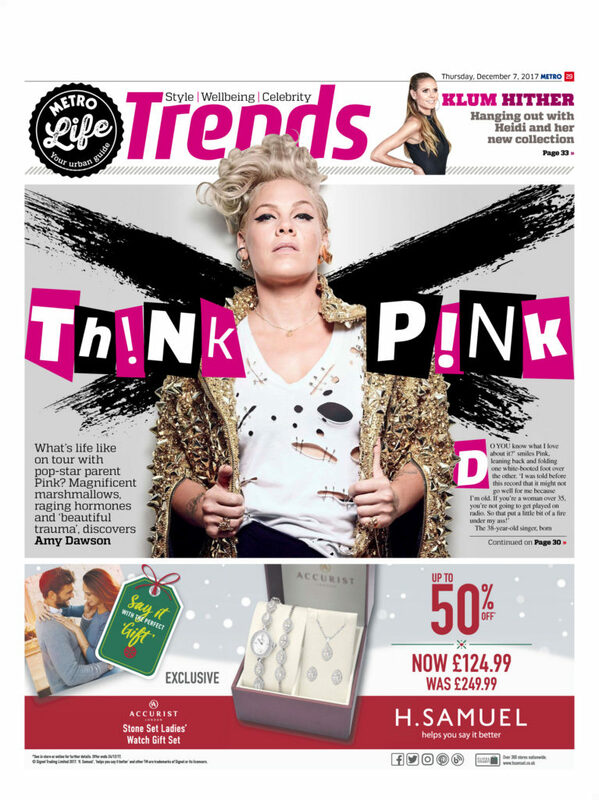 Pink is funny, kind-hearted, pottymouthed and feisty – all the attributes you could wish for in a grown-up pop star. But it’s her relatable authenticity that’s kept her relationship with her fans burning during a 17-year career. ‘I feel like I’m a viral rash, I just don’t go away and you can’t cure me!’ she laughs, pondering the reasons for her career’s longevity. ‘But seriously, I have no idea. I think it’s that I believe in being totally, uncomfortably honest. I hear from people that are like, “You went through that? I went through this.” That’s the power of truth and song, and that’s why I do what I do.